The coverage of living corals on Australia's Great Barrier Reef could decline to less than 10 percent if ocean warming continues, according to a new study. KNOXVILLE—The coverage of living corals on Australia's Great Barrier Reef could decline to less than 10 percent if ocean warming continues, according to a new study that explores the short- and long-term consequences of environmental changes to the reef. Environmental change has caused the loss of more than half the world's reef building corals. Coral cover, a measure of the percentage of the seafloor covered by living coral, is now just 10-20 percent worldwide. The Great Barrier Reef, once thought to be one of the more pristine global reef systems, has lost half of its coral cover in only the last 27 years. Overfishing, coastal pollution and increased greenhouse gas emissions leading to increased temperatures and ocean acidification, as well as other human impacts are all affecting the delicate balance maintained in coral reef ecosystems. Now, in a new study that aims to project the composition of the future Great Barrier Reef under current and future environmental scenarios, researchers found that in the long term, moderate warming of 1-2 degrees Celsius would result in a high probability of coral cover declining to less than 10 percent, a number thought to be important for maintaining reef growth. In the short term, with increasing temperatures as well as local man-made threats like coastal development, pollution, and over-fishing, the study found that corals—tiny animals related to jellyfish—would be over-run by seaweed which would, in effect, suffocate them. In the longer term, interactions among reef organisms would lead to dominance by other groups, including sponges and soft corals known as gorgonians. The study, now in pre-print online in the journal Ecology, uses a multivariate statistical model and includes quantitative surveys of 46 reef habitats over 10 years of data from 1996-2006. 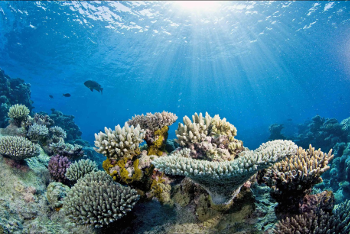 "The model indicated that warming of an additional 1-2 degrees Celsius would more than likely lead large declines in coral cover and overall changes to the community structure," said lead author Jennifer K. Cooper, a graduate student in marine biology at James Cook University. "If our model is correct the Great Barrier Reef will begin to look very different as ocean temperatures increase." Cooper was part of an international team of ecologists who conducted the study at the National Institute for Mathematical and Biological Synthesis (NIMBioS). "Even the massive, remote, and intensely managed Great Barrier Reef is being degraded by human activities. Losing the GBR and other reefs would be a massive blow to marine biodiversity and to the people that depend on healthy reefs for food, tourism, and protection from storms," said co-author John Bruno, a marine ecologist from the University of North Carolina, Chapel Hill. The Great Barrier Reef, which stretches along most of the coastline of the state of Queensland and is about the size of Japan, contains the world's largest collection of coral reefs, with 400 types of coral, 1,500 species of fish and 4,000 types of mollusks. The United Nations listed the reef as a World Heritage site in 1981, but is being considered this year to be placed on the List of World Heritage in Danger. The study matches similar dynamics found in a recent study widely reported in the media, which said that some parts of the Great Barrier Reef can recover in the short term from damage due to global warming. Yet, the longer term future is bleak for the coral reefs in spite of any short-term recovery. Co-author Matthew Spencer, who conducted the study while a sabbatical visitor at NIMBioS, said that the findings are not only important for predicting reef futures under climate change but could also be applied to other ecosystems. "The beauty of this study is that the same approach should work for other systems, provided enough data are available,” he said. “Our next plan is to use it to model the dynamics of European forests." Citation: Cooper JK, Spencer M, Bruno JF. 2015. Stochastic dynamics of a warmer Great Barrier Reef. Ecology. [Online Pre-Print] 12 January 2015.